Peter and the Wolf. 1949. Etching and soft ground, 6 x 9 in. Color etching, engraving and aquatint, 9 x 13 in. Color etching, engraving, aquatint and soft ground, 10 x 13 ¾ in. Love Scene from Faust. 1956. Engraving, aquatint and soft ground, 12 x 15 3/8 in. 14 x 11 ¾ in. Color etching, engraving, aquatint, soft ground, mezzotint and scraper, 17 7/8 x 14 7/8 in. 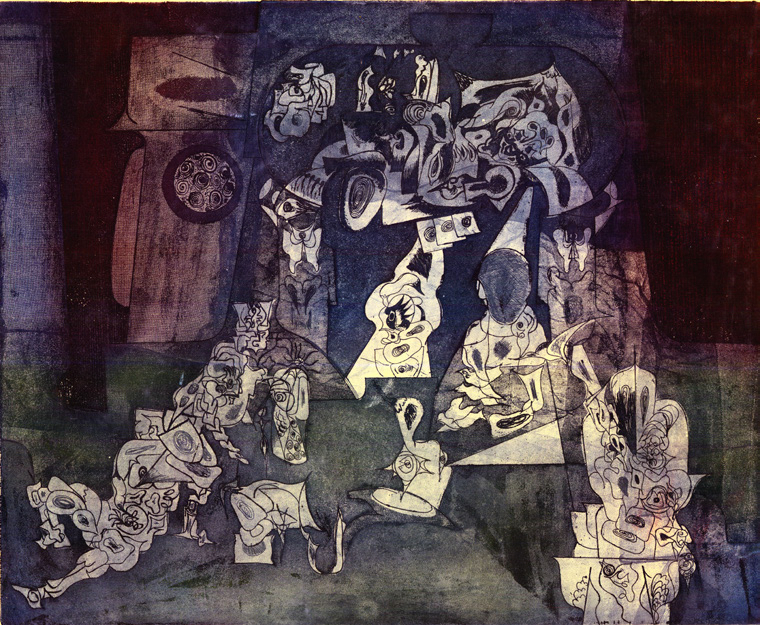 Color etching, engraving and aquatint, 17 ¾ x 14 ¾ in. 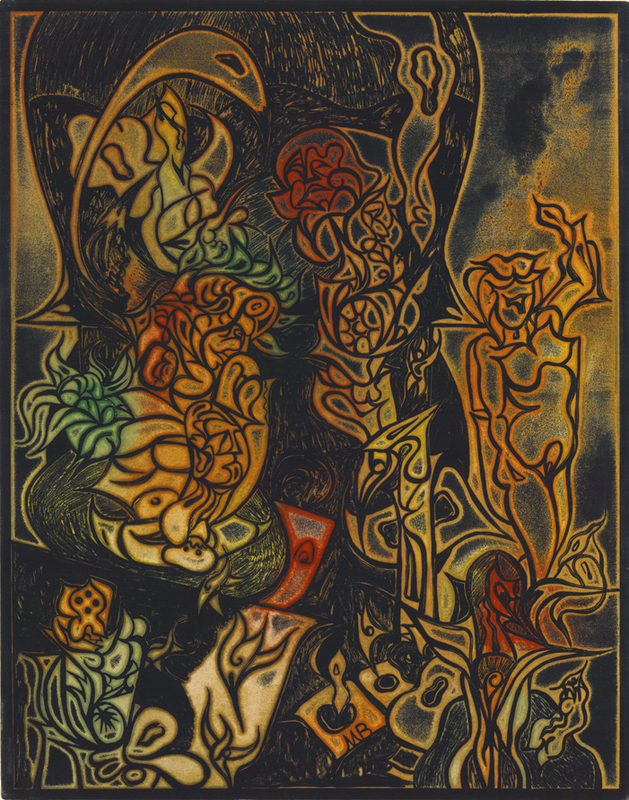 Color etching, aquatint and soft ground, 17 ½ x 20 in. 14 7/8 x 18 in. Portrait of Robert LoPresti. 1962. 13 x 9 5/8 in. 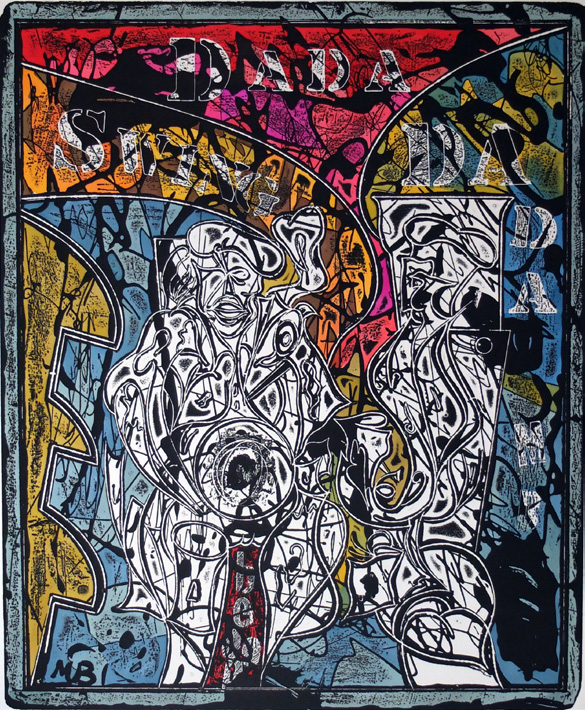 Color etching, engraving and aquatint, 12 7/8 x 16 ¼ in. 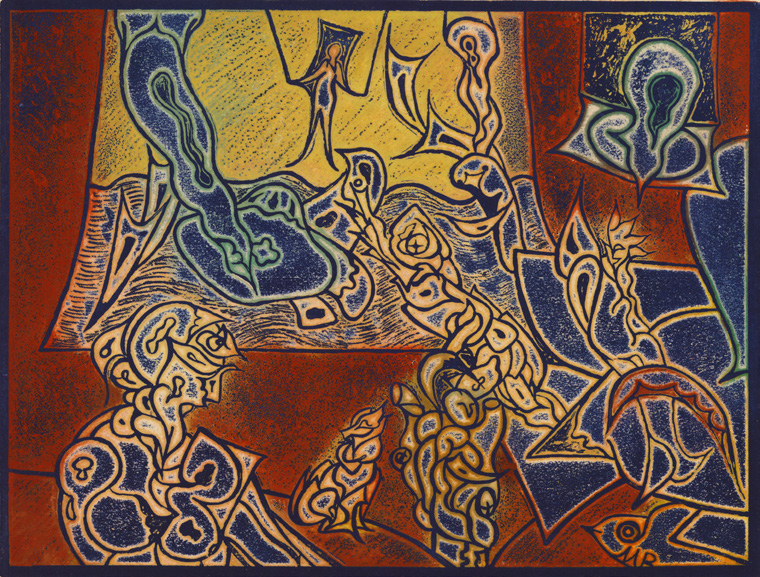 Color intaglio etching with aquatint, 23 ¼ x 17 7/8 in. Color intaglio etching, aquatint, and soft ground, 12 ¾ x 16 ¾ in. Color intaglio etching, aquatint and soft ground, 23 1/8 x 17 1/8 in. From An Homage to Lucas Moser portfolio. Color intaglio etching, aquatint, and soft ground, 24 x 18 ¾ in. Inspiration of the Poet. 1967. 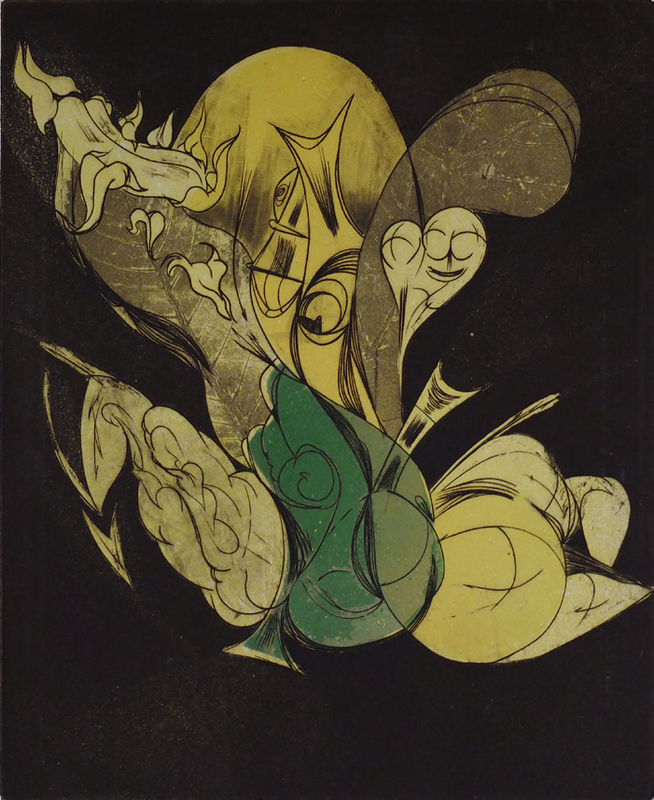 Color Intaglio etching, aquatint and soft ground, 23 ½ x 17 ¾ in. 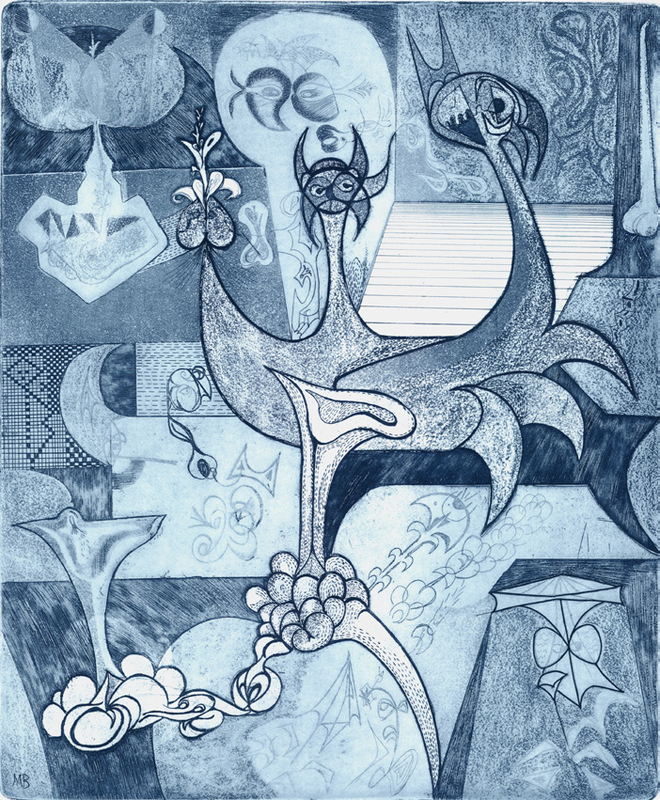 Color intaglio etching, aquatint, and soft ground, 17 ¾ x 13 ½ in. Color intaglio etching and soft ground, 21 ¼ x 17 ¼ in. Venus II (The Venus Worship II). 1969. Color intaglio etching and aquatint, 25 7/8 x 17 ¾ in. 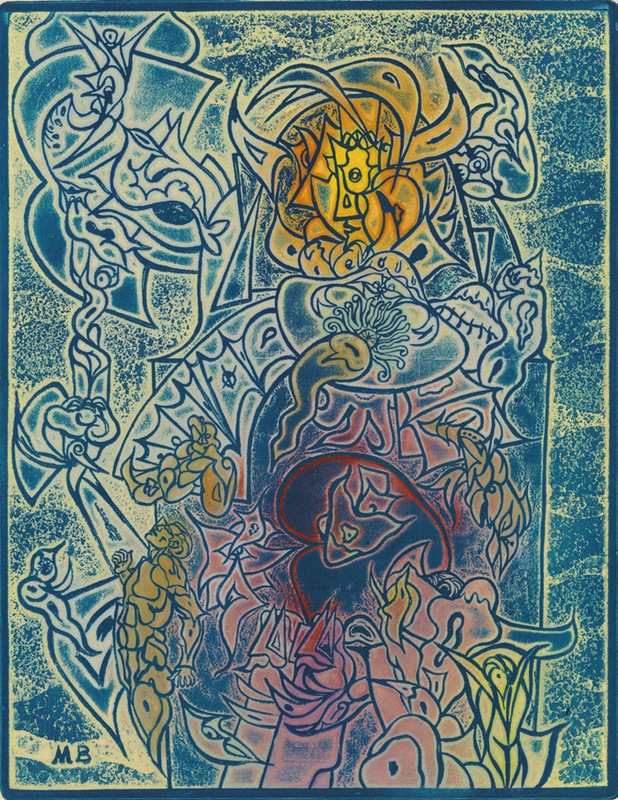 Color intaglio etching and aquatint, 22 x 17 ¾ in. Color intaglio etching, aquatint and soft ground, 20 ¾ x 17 ¾ in. Big Fish Eat Little Fish. 1979. Color intaglio etching with embossments, 6 ½ x 11 ½ in. Alice in Wonderland Suite — Chapters 11, “Who Stole the Tarts?” and Chapter12, “Alice’s Evidence.” 1981. 17 ¼ x 12 ½ in. Intaglio etching, 10 x 8 in. Intaglio etching with added hand watercolor, 17 ¼ x 14 ¼ in.